His first band invented British folk-rock when he was still a teenager. He placed #20 on Rolling Stone's list of all-time great guitarists (and some people think he was robbed.) His songs have been performed by everybody from Bonnie Raitt to Los Lobos, from Linda Ronstadt to the Five Blind Boys of Alabama, from David Byrne to Elvis Costello. Oh, and he's a British Muslim. Yet with all that, Richard Thompson is still not a household name. Go figure. Maybe that's the price he's paid for sticking to his own, very particular vision of literate and dark lyrics set to pulsating rock, Celtic-influenced acoustic music, and harmonically sophisticated electric guitar. But the list of artists who have covered his songs show how widely he's admired by singers, songwriters, and guitarists. 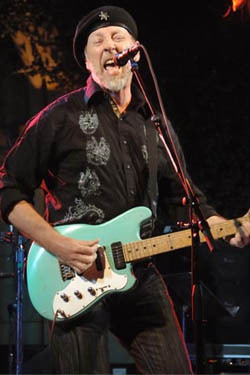 Richard Thompson was once quoted as saying he wanted to be "the best guitar player, the best singer, the best songwriter." So which is most important to him? "The package, I suppose - but what I focus on is the songs." And what about that conversion to Islam? Like many young counterculture Westerners, Thompson was initially drawn to Islam through Sufism, with its emphasis on love and transformative spiritual experiences. He became a dedicated adherent, and now describes himself as a "liberal Muslim" rather than a Sufi. "I suppose you could call me a 'lapsed Sufi,'" he says, "but I still embrace the Sufic interpretation of Islam." When it comes to famous British converts, there's Cat Stevens/Yusuf Islam - and then there's Thompson. But he and his sometime bassist and fellow Muslim Danny Thompson (no relation) don't look like exotic specimens. They seem more like guys you could have a beer with down at the pub. Does he feel his visibility as a performer and a Western convert carries any responsibility? "I hate to be a spokesman for anything as broad as Islam," says Thompson. "You can easily be misinterpreted. A lot of what is seen as Islam in the West comes from the loudest shouting voices, the neo-Islamic fundamentalists." "The willingness to fight, the violent side, is a misinterpretation and a misapplication of the teachings of the Prophet," adds Thompson. "It ignores the heart of Islam: peace, generosity, and compassion. Islam is about winning hearts and minds." As for the "convert or die" crowd, Thompson adds: "There is no compulsion in Islam at all. That's a fact." After his conversion, Thompson wrote a number of religiously-themed songs, but today he writes about everything from barfights to broken hearts. Nothing particularly "Islamic" in these tunes, most people would say. "They're not necessarily autobiographical," says Thompson. "The important thing is to represent who you are. You have to embody that and be honest about who you are." "I'm a rock and roll musician," Thompson says. "Whatever else I am, I'm that too. And my religion makes me a better musician, and better able to navigate these shark-infested waters a musician must navigate ..."
As for his craft - or crafts - Thompson credits his lean way with a lyric to the influence of traditional music. "I grew up with the folk tradition," he says. "I've been listening to Scottish ballads since I was a kid. That's the place to learn about language - about succinct language, about not wasting a word." "Precision" is the word Thompson uses for folk music. "Folk songs aren't really written by any one person," he says. "They're handed down from generation to generation, always being honed, always being polished, until there's nothing left that isn't vital. Anything else gets cut away - ruthlessly." "The weak words," he adds, "get eliminated." They say we are what we love, so a probe is launched. As a guitarist, what is Thompson's favorite solo by, let's say, studio great James Burton? Burton played the famous "Susie Q" riff when he was sixteen, performed on every early Ricky Nelson hit (hint for boomers: he was the guy mugging behind Ricky on TV), and worked with everybody from Elvis on down. "Hmm," he answers when the question is posed. "What's yours?" "Young World," by Ricky Nelson. A pause indicates ... what? Disagreement? Contemplation? "That's a subtle solo," says Thompson. "And 'Hello Mary Lou' was a breakthrough lead part. But I'd have to say that my favorite may well be a pretty obscure Everly Brothers track, 'Ain't That Lovin' You Baby.'" "It's a ferocious solo," he adds. "Powerful stuff." And what about Roy Nichols, Merle Haggard's longtime lead guitarist? "Ah, what fantastic tone he had." Now we are in agreement. "Absolutely terrific," says Thompson. "His playing on the 'Live in Muskogee' album was probably my favorite." As for his own playing, Thompson credits his study of Celtic and pipe music, with their "very strange intervals," for some of his sound. Does his spiritual life affect his playing, either by imposing discipline or providing inspiration? "What you believe affects everything you do," he say. "Being spiritual is about appreciating life. After all, life is a finite thing. After life there might be someplace else to go ... (but) being alive in the moment is being spiritual." So when he's playing, is he alive in the moment, or is he transported somewhere else? "It's the same thing, in the end. You're inside the music. It forces you to be in the moment. You have to live it." While he's dedicated to improving both his guitar and vocal skills, to hear Thompson tell it these talents are primarily delivery systems. The song is the payload. "My primary goal," he says, "is to present the song as best I can. I try to bring my other skills to it, and to continue the narrative of the song instrumentally." He adds: "As a singer and guitarist, the song is always the focus." Yet his guitar playing has legions of fans who are dedicated to his fluid playing, his virtuosity, his innovative phrasings and harmonies. Is he a "gearhead," as guitarists sometimes call themselves? Does he haunt guitar shops admiring vintage instruments? "No," he says. "They're just tools to me. They can be lovely tools, and I enjoy them, but I'm not a guitar polisher. I think of them as functional things." Thompson is known for playing Fender-style guitars, yet I had read that he bought a very different kind of guitar from our mutual friends at Westwood Music in L.A. "(The Peerless) is a lovely guitar," says Thompson, who has used it in the studio. "But," he adds, "I don't own more than a dozen guitars." That's a low figure in the world of famous rock guitarists. But it's clear Thompson is passionate about politics, and the discussion doesn't stop there. I mention a recent magazine article I had written about the difficulties involved in maintaining a spiritual outlook while remaining politically aware. "I understand the problem," Thompson says. "It's very difficult to follow politics without feeling rage, resentment, and despair. But things are changing." "I see America headed toward something like a Socialist revolution," Thompson says. "The big corporations, the banks, the other powerful interests who decide policy now - their policies are incredibly unpopular. Of course, they're not going to give up without a fight. And as they drive the American middle class into poverty this huge, poor, dispossessed middle class is going to be really pissed off." "They're going to demand a say," adds Thompson. "The American people have no say in their destiny. Everything is manipulated. They can only last for so long. The only opportunity for reform may come from a revolution fifteen years or so down the road." Why hasn't the last decade produced a galvanizing political song? The history of the Twentieth Century includes many songs that captured the spirit of the times: "Buddy, Can You Spare a Dime?" "This Land Is Your Land." "We Shall Overcome." "Blowing in the Wind." "Give Peace a Chance." Where is today's "movement song"? "I think it's coming," Thompson replies. "Incumbent politicians have managed to diffuse opposition, skillfully and effectively." "That's interesting," Thompson says of this theory. "They've managed to defuse opposition somehow - we know that. But it's just a matter of time before it happens." At the end, Thompson is asked whether he wants a chance to review his quotes for accuracy before the interview is published. "Nah," he says. "Publish and be damned." * To order "Sweet Warrior," go here. * To order a box set of Thompson's work, "Watching the Dark," go here. * To order the really big box set of his work, go here. * To see him sing "Persuasion" with his son Teddy, go here. * For a brief video profile with live performance, go here. For more music posts, go here.